“Rock garden.” If you’re already familiar with this concept, pretend that you’re hearing about it for the first time. Sounds kind of comical, doesn’t it? After all, what kind of garden could you make with rocks? Sublimely beautiful ones, it turns out. 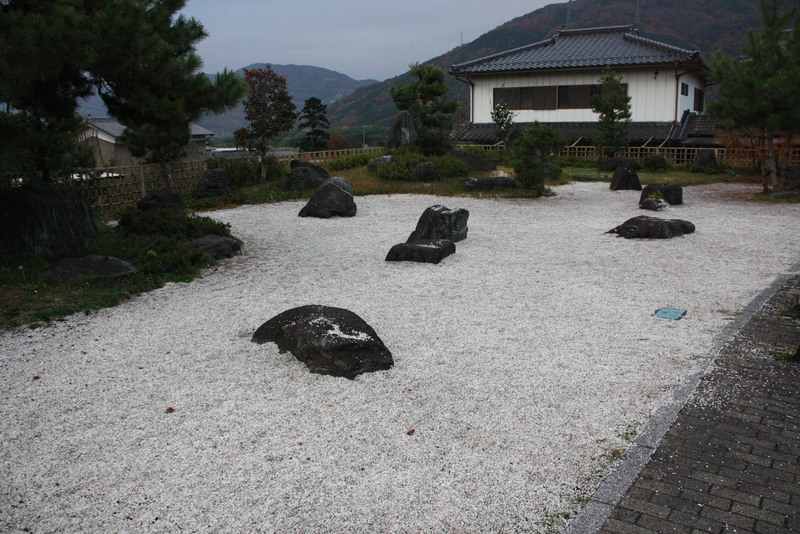 A rock garden is a sort of imaginary landscape, sculpted out of raked gravel and meticulously placed stones. Colour is often limited to a narrow range of greys, which only serves to emphasize the garden’s lines and shapes, resulting in a streamlined, minimalist aesthetic experience. In the world of art, this is so often the way: an absurd idea becomes brilliant, once newcomers take the time to consider it thoroughly. You may be shocked to hear that Japan is occasionally associated with absurd ideas. This is one of the good ones. While the word “garden” may be most closely associated with flowers and vegetables, there are many other kinds. Woodland gardens embrace shrubs, mosses, and other plants normally found in the woods. Water gardens, graced with streams and pools, may feature a variety of aquatic plants. Grandest in scale is landscape gardening, in which the gardener becomes a sort of deity, moving about trees, boulders, and the earth itself. So what is a garden? One possible definition would be “nature, shaped by human hands”. Any part of nature will do, including the humble rock. Who deserves credit for the invention of rock gardening? 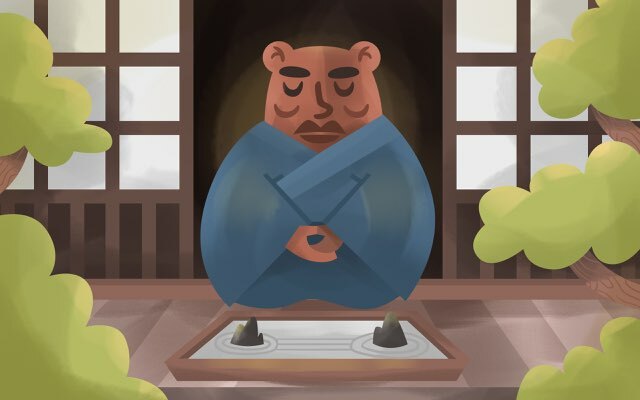 That would be the fine folks at Zen, Inc.
Like any spiritual movement, Zen is a complex cultural phenomenon, united by common principles yet encompassing a variety of subdivisions. Broadly speaking, however, Zen is a branch of Buddhism that emphasizes meditation and disciplined thought as the path to enlightenment. 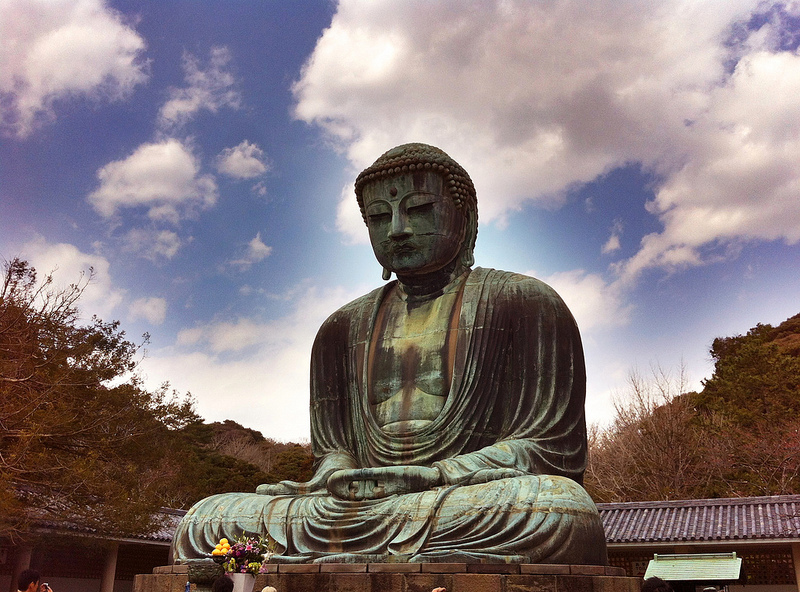 Tranquility, gentleness, concentration, and carefulness may all be cited as Zen ideals. Throughout history, wherever a distinct cultural movement has emerged, aesthetic traditions have emerged that reflect its values. Even austere religious types devoted to simple lives void of rich material objects are responsible for artistic works of one kind or another. After all, nearly everyone acknowledges the need for a few basic material things: shelters, containers, essential furniture and implements…all of which reflect the minds and hearts that fashion them. 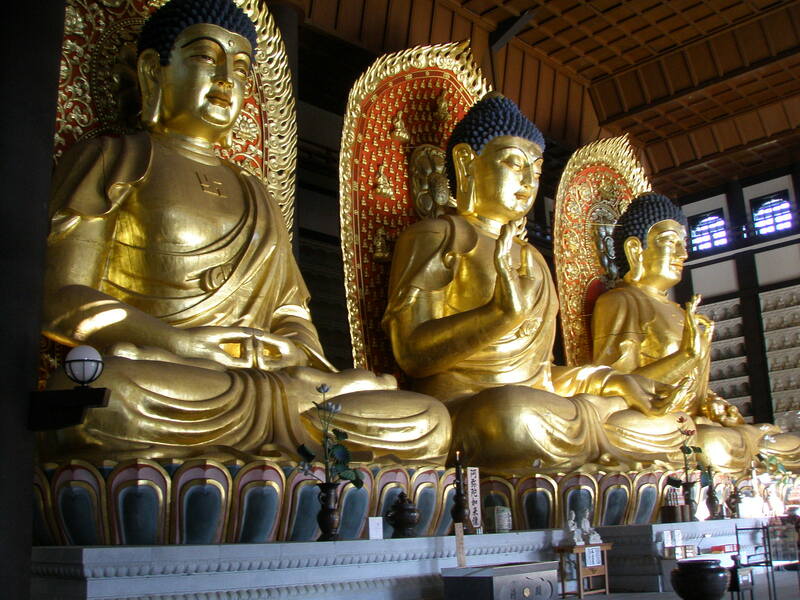 Buddhism has blessed the world with countless breathtaking works of art, including temples, statues, and wall paintings. And rock gardens. The classic rock garden consists of a gravel bed dotted with a small number of larger stones arranged singly or in groups. With no distracting elements, the position and orientation of these stones becomes aesthetically paramount. The balance and rhythm of the composition comes down to a few simple choices. What could be more Zen than this: achieving fulfillment through a few meticulously placed ideas within a vast, peaceful canvas? 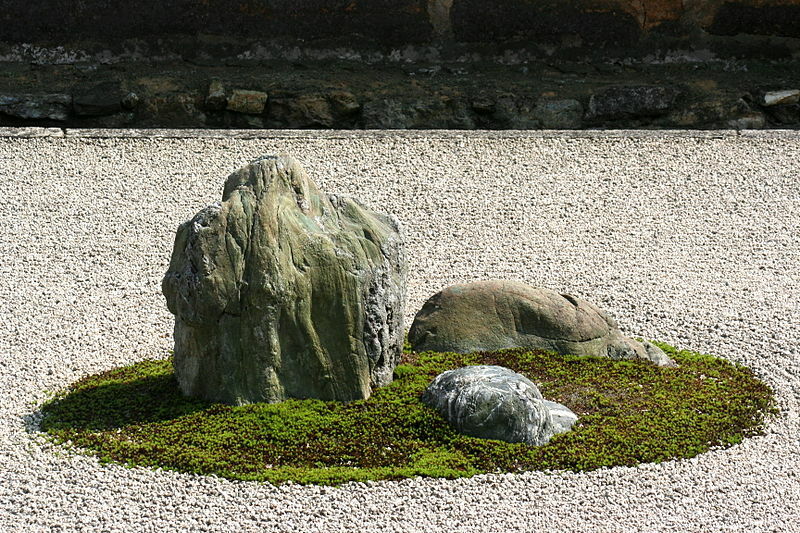 The visual impact of a rock garden is not unlike many styles of modern art, which often embrace a similarly minimalist beauty. From the blank-surfaced houses of Le Corbusier to the chamber music of Philip Glass, Zen principles can be spotted all over the modern art scene. 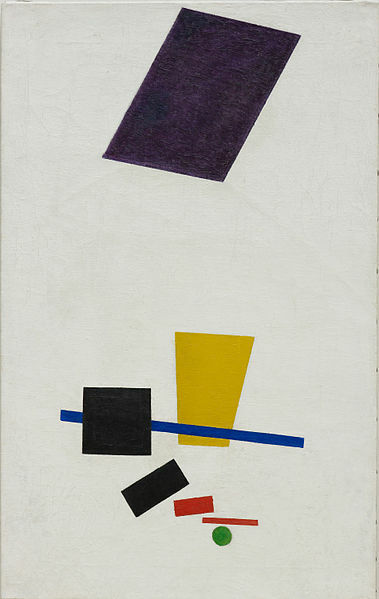 The sparser paintings of the suprematist movement leap to mind. Of course, when we say “modern art” we often mean modern Western art. Those clever Zen folks had this figured out long before Picasso et al. came along. Rock gardens don’t come in just one style, however. While many exhibit a high degree of minimalism (in the extreme case, a garden may consist solely of gravel), others introduce varying levels of complexity. They may incorporate greater numbers of large stones, or relieve the harshness of an all-stone canvas with vegetation, such as moss, grass, or shrubs. Are You Ready to Rock (Garden)!? Enough with the history lesson. Let’s look at a bunch of pretty pictures. 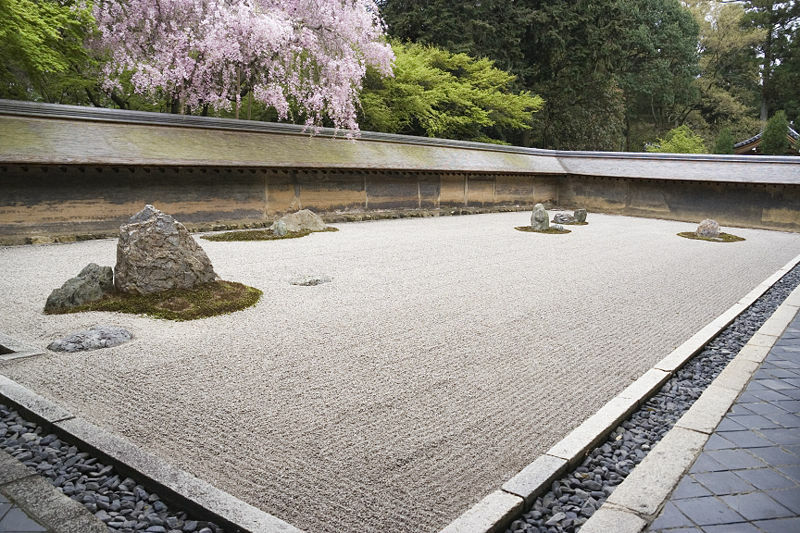 This rock garden, one of Japan’s most famous, is found at the Zen temple of Ryōan-ji, Kyoto. As you can see, it consists simply of gravel, rocks, and moss. 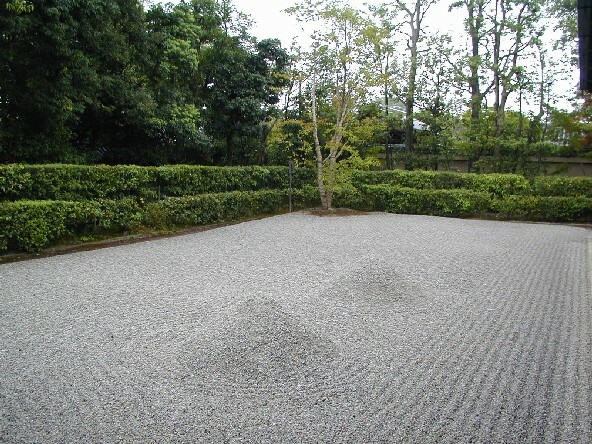 Note that the gravel is freshly raked. Indeed, raking is performed regularly, thereby adding an interesting aesthetic dimension to the rock garden: instead of a static, finished artwork, the garden is a continuous creation that is lovingly maintained. Here’s a closeup of a stone grouping, a common feature of Zen gardens. 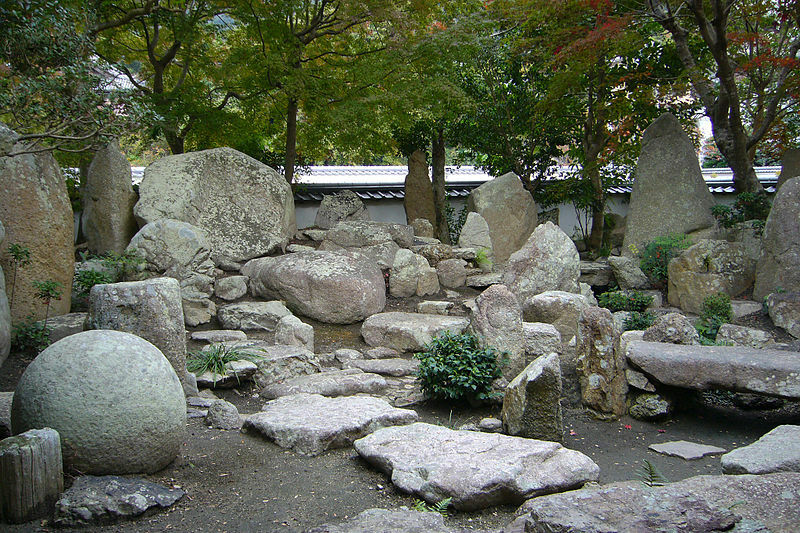 These groups, which feature various numbers of stones, are rather reminiscent of small groups of friends keeping each other company in a big, mostly empty world. Aww. This is a garden at Daisen-in, another major Zen temple of Kyoto. Have you ever thought that rock gardens resemble bodies of water (the gravel bed) with little islands (the larger stones)? Well, that’s certainly what these gardeners had in mind. Note the stone “boat” in the above photo, floating in the gravel “water”. 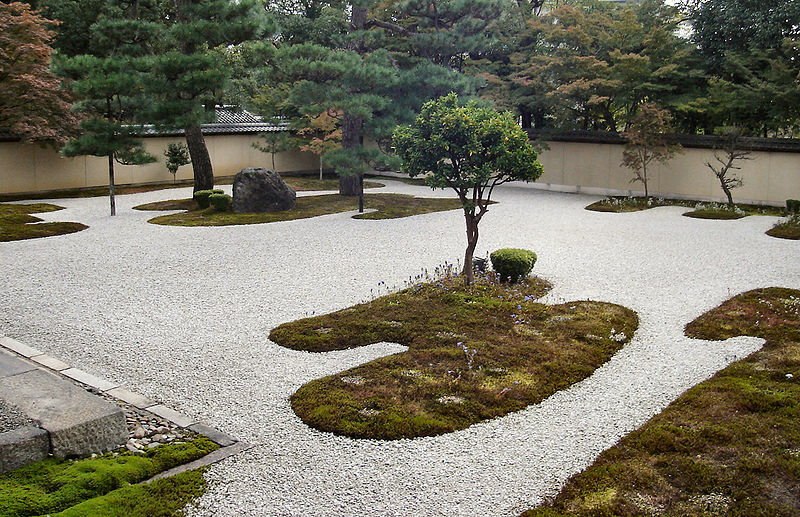 And here we see the ultra-minimalist garden of Daisen-in. By omitting large stones altogether, the composition is comprised purely of rake grooves. 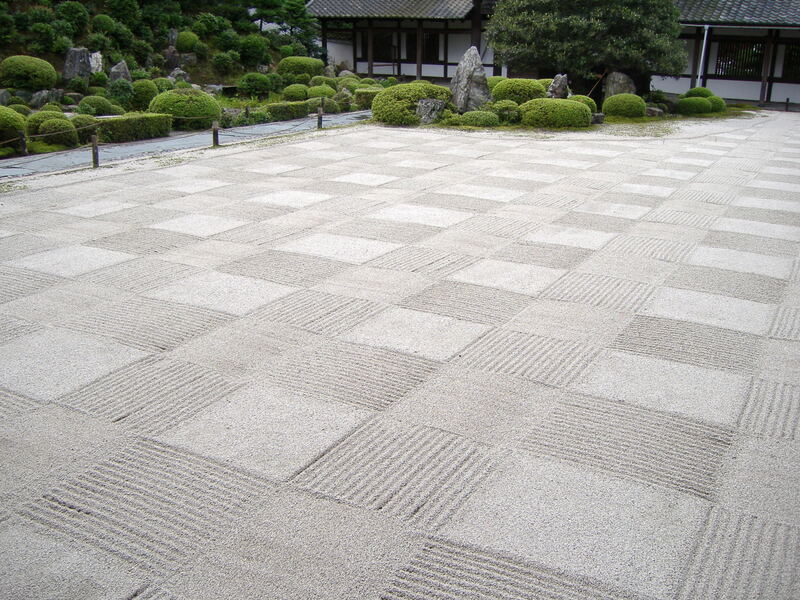 You can see the same idea at work in a checkerboard-style garden at Tōfuku-ji, yet another Kyoto temple. At this point, you may reasonably wonder whether all rock gardens are simple and mostly empty. But no! Art is never that straightforward. Someone, somewhere always has to be different. 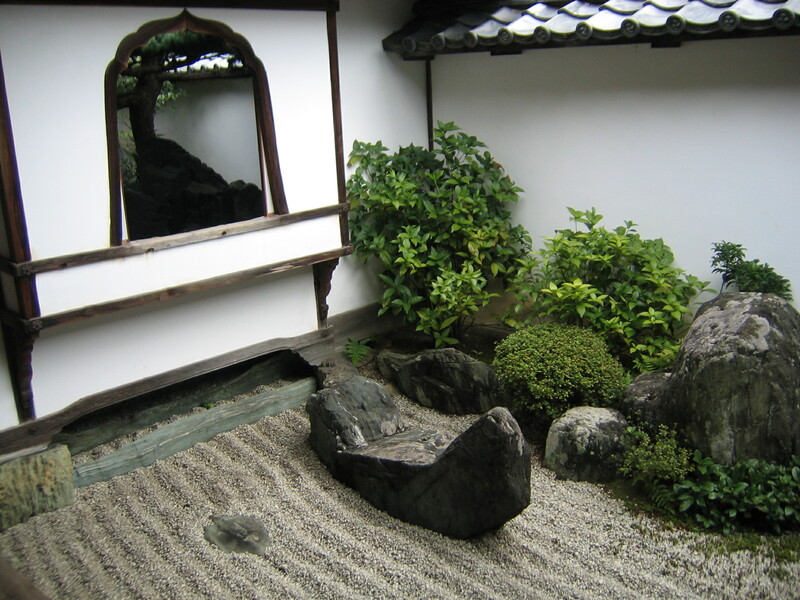 In the case of rock gardening, one such has-to-be-different-er can be found at An’yō-in, a temple in Kobe. Check this place out! It’s packed with all kinds of rocks, big and small, roundish and squarish, flat and pointy, balanced and lopsided. It’s as if all the other rock gardens are empty because everyone is here, partying it up. Could it be that An’yō-in is also party central for Zen monks? I hear those are some crazy parties. Everyone gets totally enlightened. 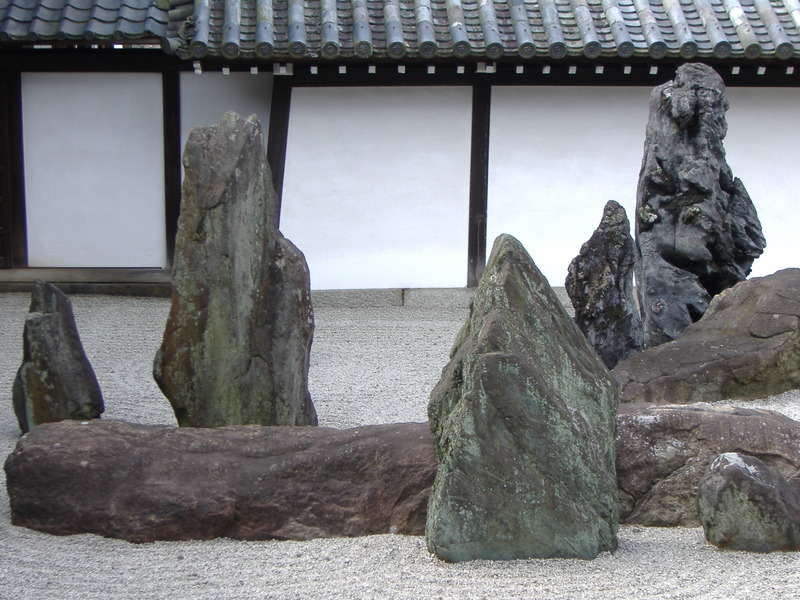 At Tōfuku-ji, another Kyoto temple, we find a garden with some long skinny rocks. The scene isn’t as packed as the previous garden, but we do get some visual interest in terms of texture (smooth versus craggy) and orientation (horizontal versus vertical). This garden plays with the gravel bed by introducing voids, resulting in pleasingly-shaped grassy “islands” in the stoney sea. You can almost see little pebbly waves lapping along the shorelines. 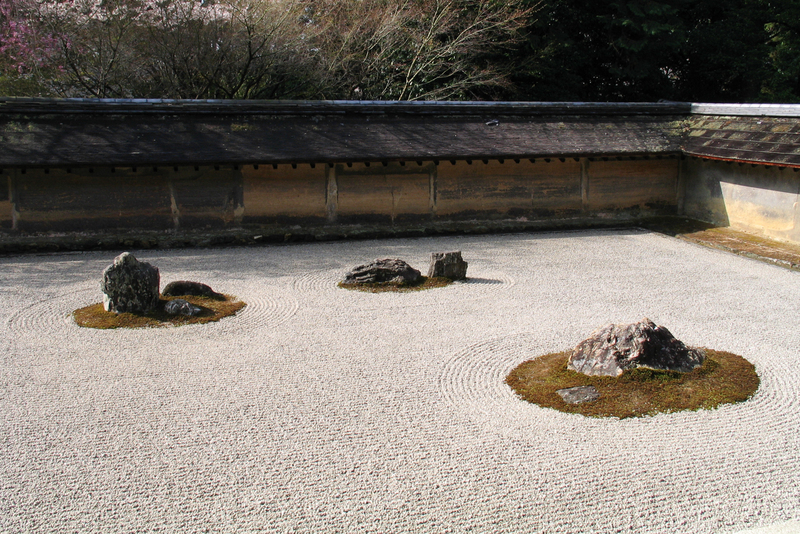 Many of Japan’s rock gardens have been maintained for centuries. Some have achieved World Heritage Site status with UNESCO. At this point, I hope you agree that they deserve it. Me too! Let’s build one together. First, you need some rocks. (Good thing I’m here to tell you these things.) This might be as easy as walking outside, or you may need to visit a park or beach or something. Or you could pick up some aquarium gravel/stones at a pet store. For most of us, a full-size rock garden just isn’t practical. But that’s ok: a true Zen gardener recognizes that such physical limitations don’t matter. A miniature rock garden is just fine. You can build one in minutes and keep it anywhere in the house. To hold your garden, any small container will do (dish, shoebox, aquarium, hat). You should use some container, though, unless your family/roommates have unusually relaxed standards when it comes to leaving piles of rocks around the house. If you’re feeling ambitious, you could acquire some little plants for your garden as well. Once you have all the materials you want, refer back to the example gardens above. Which styles/elements appeal to you? Review these examples for inspiration, then go ahead and build a garden exactly as you like! Remember, the appearance of three-dimensional art can change radically depending on light conditions. Try placing your garden near a window to capture interesting effects of sunlight/moonlight. 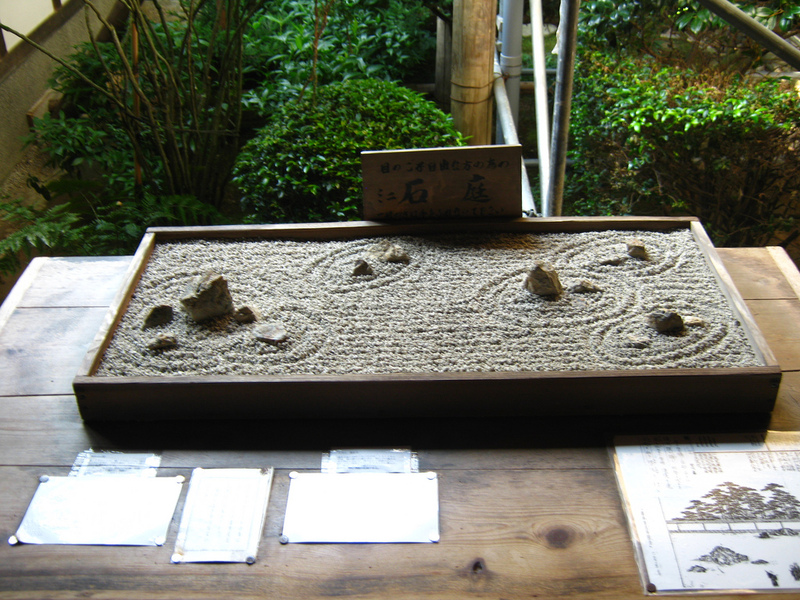 When your rock garden is finished, say a little thanks to the Zen monks who developed this lovely art form. Sit on the floor in a meditation position and gaze upon your creation. Breathe deeply, relax, and let the simple beauty of the rock garden bring you peace and contentment. Consider how life is like a rock garden. How happiness is so often found in simple things. How we humans are, in a sense, a handful of rocks in the middle of a vast gravel bed. Continue to meditate on this subject until you’ve achieved total spiritual enlightenment, or at least until your legs get sore.